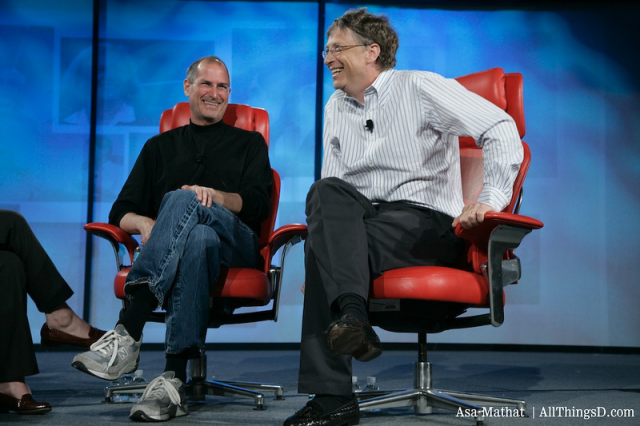 Shortly after the announcement of Jobs’s death, Gates sent a statement to AllThingsD, offering his condolences to Jobs’s family and friends and praising Jobs’s impact. The pair appeared together in a memorable joint interview at D5 in 2007, in which each praised the other’s accomplishments and reminisced together about their long careers. Asked what the biggest misunderstanding about their relationship was, Jobs quipped that it was the fact that the two had kept their marriage secret for so long. Then things turned serious, with Jobs noting how the two men — once the youngest men in the room — were now the old men of technology. For his part, Gates reflected on Jobs’s sense of the consumer and his willingness to take big risks, including Apple’s bold bet with the Mac.